System Healer is the PUP that uses misleading techniques to prevent removal. Use Reimage to locate malicious components and get rid of them faster than with uninstall instructions. A full system scan blocks virus reappearance and prevents traffic to malicious domains. System Healer: a rogue PUP or a reliable PC optimizer? System Healer is considered to be a potentially unwanted program (PUP) that should be avoided because of several reasons. No matter that its developer System Healer Tech Sp. Zo.o. has been actively promoting it through its official website, it can also show up on your computer without your intention. In this case, you need to think about third party software that you downloaded during the last several days. It might be, that you left the checkmark saying that you want to install this questionable optimization tool as an optional component when installing this software. In this case, you should think about System Healer removal. Of course, you should also keep in mind that this app is offered as a PC optimization tool. No matter how attractive “System Healer Cleanup Console” and similar terms seem, this program can hardly improve your Mac's speed. Its database is not efficient enough to improve the performance of your machine, and all it does is reports about cookies, cashed files, and similar components. Last, but not least, the PUP is not fair because it asks to pay for its service, which is quite questionable. As you can see, it is quite a suspicious optimization tool that does not differ from others. No matter that you can also find different System Healer review with different opinions on the Internet today, we think that you should avoid this tool. Therefore, if you have received an offer to install this rogue PC optimizer, reject the offer and look for a more reliable tool. If, however, you have this optimization tool on your computer, you should remove System Healer virus without a doubt. Reimage or Plumbytes Anti-MalwareMalwarebytes Malwarebytes does this for you faster. At the time of writing, the software is not compatible with Mac OS. It supports all types of Windows OS (7, 8, 8.1, XP, Vista, 10), so if you are using one of them, be careful. As we have already pointed out, System Healer is promoted on the official web page and can be downloaded directly right there. However, people seldom install it willingly. The vast majority of victims have installed this app along with another free software (e.g. download manager, file compression/decompression software, media player, etc.) without even realizing that. If you are not willing to live through such experience, install free programs more carefully. System Healer tries to win trust with fake users' positive reviews. 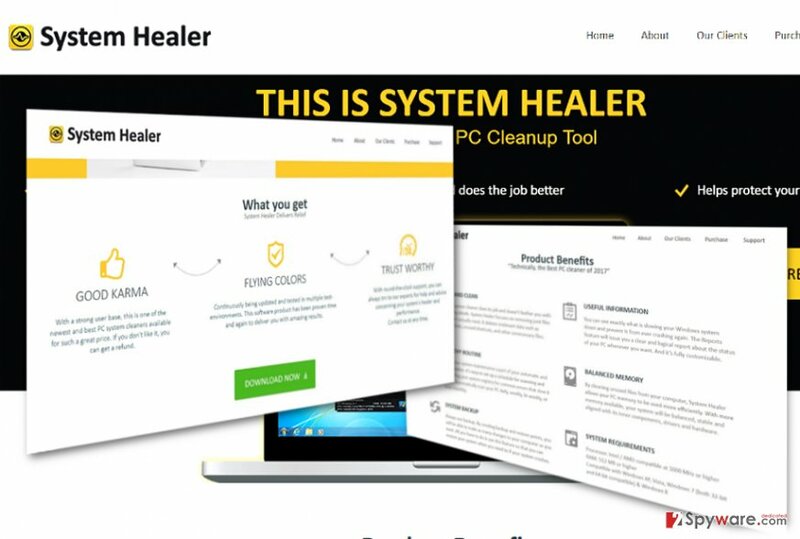 System Healer is said to have “a faster and stronger, more advanced way of finding and eliminating the issues that other PC cleaners can’t detect.” Therefore, it's natural that the first thing that you will notice immediately after infiltration of this optimizer is scheduled system scans. We would like to warn you that the scanners that System Healer malware loads look professional. Besides, the scan results may inform about tens of errors, issues, infections, etc. Unfortunately, but you should be aware that the scan results can be invented. To check that, we would highly recommend you to use another PC optimization tool. It might be that this rogue optimization tool informs about alleged system issues. Therefore, DO NOT fall for buying System Healer license key. It's a useless piece of software that can't improve your PC's performance. In contrast, continuous system scans can diminish your PC's performance, and you may be a bit annoyed by continuous alerts about issues/errors. Thus, if you do not want to lose your hard earned money for nothing and want to maintain you PC correctly, run Plumbytes Anti-MalwareMalwarebytes Malwarebytes (for Mac OS X and Windows) or Reimage (for Windows), and remove System Healer virus from your machine. Not to mention, according to System Healer reviews, it seems that this tool may also be involved in online scam affairs. Once installed, it may start showing pop-up ads claiming that your PC needs some serious help. Therefore, you may be provided with a supposedly toll-free number of professional technicians. Do not fall for System Healer scam because you may receive an increased telephone bill or experience other issues in the future. Thus, if this application has already been installed on computers, go to the Page2 and find the manual and automatic removal instructions there. Click System Healer and select the Uninstall/Change option. Click Yes and OK to save the changes. Nevertheless, after that, we highly recommend you to run a full system scan with Reimage, Plumbytes Anti-MalwareMalwarebytes Malwarebytes or another professional anti-malware to delete all other potentially unwanted/malicious programs. Note that every users should be cautious of thsi optimizer. Even if you reside in China, you might notice the ads promoting this PUP. ^ JP Buntinx. Top 6 Types of Rogue Security Software. The Merkle. IT news and commentary. ^ Ellen Tannam. 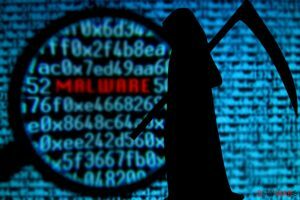 ShadowPad malware hid powerful backdoor in popular business software. SiliconRepublic. technology, science and star-up news. ^ Eliminate computer threats. Wubingdu. Security and spyware news in Chinese. This entry was posted on 2017-08-17 at 03:11 and is filed under System tools, Viruses. You can quickly scan the QR code with your mobile device and have System Healer manual removal instructions right in your pocket. How did you remove System Healer?